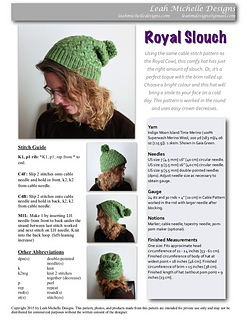 The Royal Slouch uses one skein (approximately 200 yards) of Indigo Moon Island Time Worsted Merino and is shown here in Gaia Green. Pattern includes stitch guide, list of abbreviations, and the stitch pattern is both written and charted. One size: Fits approximate head circumference of 21 - 24 inches (53 - 61 cm). Finished circumference of body of hat at widest point = 18 inches (46 cm). Finished circumference of brim = 15 inches (38 cm). 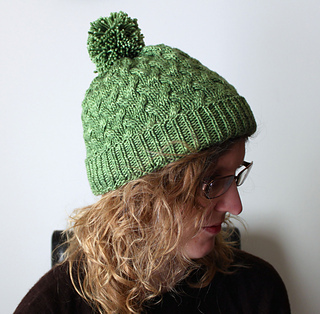 Finished length of hat (without pom pom) = 9 inches (23 cm). 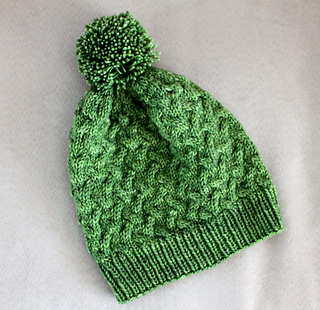 Skills required: knitting in the round, increasing, decreasing, cabling with a cable needle, making a pom-pom (optional). Stitches used: k, p, C4F, C4B, M1L, k2tog.